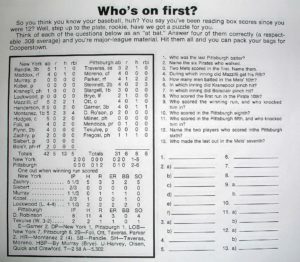 Question #1 – Who was the last Pittsburgh batter? Answer – Stennett. See the answer to question 9, to see how this played out. Question #9 – Who scored the winning run and who knocked him in? Answer – Fregosi pinch hit for Tekulve in the 10th and reached base on a single. This is when Tavares picked up his walk, 1 of 2 charged to Lockwood. With 2 on and no one out, Moreno was called on to bunt them over. He did so successfully (the only out that Lockwood recorded in the inning). Parker was then walked to load the bases and set up the potential of a game ending double play. Stennett came to bat and picked up his 2nd hit of the game, driving in his 2nd and 3rd RBI’s and bringing the game to a conclusion. Taveras scored the final run, and Stennett knocked him in.